Bangladeshi students who have been enrolled at foreign universities/educational institutions for Under Graduate/Graduate/Post Graduate/Ph.D (Doctoral) level program and received scholarship (full/partial) for the period of 1st January to 31st December. 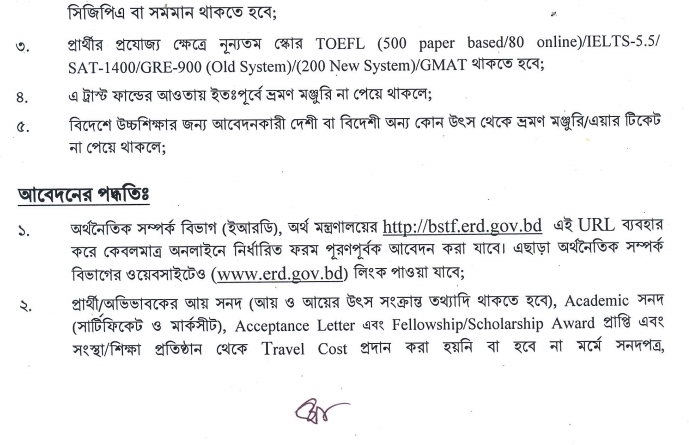 Students who have not got travel grant/air ticket from Bangladesh-Sweden Trust Fund or any other source earlier. Students securing minimum score for TOEFL (500 paper based/80 online)/ IELTS-5.5 SAT -1400/GRE-900 (Old System)/(200 New System/GMAT. Students who have not got third division/class/ equivalent GPA in any public examinations. Preference will be given to those subjects which will play an important role for socio-economic development of the country. You have to register first. Then login and fill-up the online Application Form as necessary. Before submitting you will be able to print the entire copy of your application. Beside this you will receive an auto generated copy of your application in your email after successful submission. You have to send by post/hand a signed hard copy of this auto generated application with attested copies of all the submitted documents and a passport size photograph (attested) by 3 August to F&F-3 Section, Room # 19, Block # 16, Economic Relations Division (ERD), Ministry of Finance, Shere Bangla Nagar (Planning Commission Campus), Dhaka-1207, Bangladesh.